There is something to be said about the fact that the International Criminal Court (ICC) has mostly concentrated on atrocities committed on the African continent. Charges of a regional bias emerging from African State Houses definitely have some truth to them. For the court to appear serious about ending offenses that shock the human conscience like genocide and ethnic cleansing it must have a balanced, global reach. That said, the current anti-ICC mood widespread across Africa is unfortunate. The African Union (AU) defended Sudan’s Omar al-Bashir against the ICC. Now it emerges that Kenya is lobbying other African states to garner support for an anti-ICC resolution in the upcoming AU summit later this month. Four prominent Kenyan politicians, a former police commissioner and a media personality have been named by the ICC as key suspects in the violence that rocked the East African nation in 2007-08. In retrospect, the ICC might have shot itself in the foot by aggressively pursuing the Kenyan case. Mr. Ocampo’s actions betrayed the ill-informed view that Africa’s many diverse countries are all the same. Kenya is not Sierra Leone. The country receives less than 5% of GDP in overseas development assistance and has considerable regional influence. Many have been shell-shocked by Kenyan politician’s resolve to pull out of the ICC, even in the face of international pressure. Their threats are credible because they know they can without too high a cost. The biggest losers from this anti-ICC drive within the AU will be citizens of poorer, less able African states. It is places like Chad, (North) Sudan, Central African Republic, Niger, Guinea, Zimbabwe, among others, where the collective interests of targeted communities are more or less not represented in the capital that most need the ICC. If Kenya succeeds the Deby’s and Mugabe’s of this world will get even more emboldened. Impunity on the African continent is on the rise, again. Tinderet MP and Minister of Industrialization Henry Kosgey has resigned. Mr. Kosgey is being charged with 12 counts of abuse of office and faces a maximum of 120 years in prison if convicted. In the latest case of fraud linked to the Minister, vehicles older than 8 years old were illegally imported into the country under his direction. Only a few weeks ago Mr. Kosgey was among five prominent Kenyan politicians and a radio host named as suspects by the ICC prosecutor Luis Ocampo in relation to the post election violence in Kenya (2007-08) that killed 1300 and displaced 300,000. Mr. Kosgey is Prime Minister Raila Odinga’s pointman in the Rift Valley and is the current chairman of the Orange Democratic Movement (ODM). 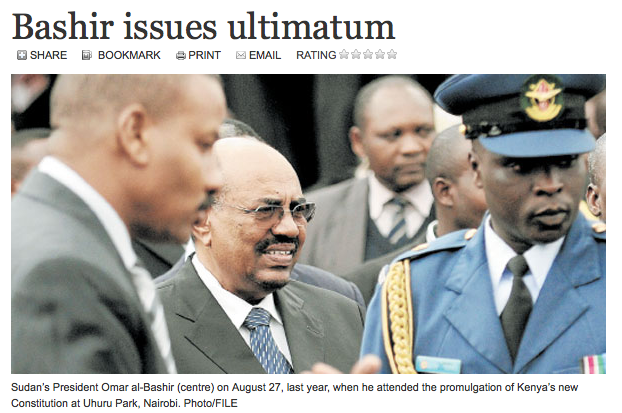 President Omar al-Bashir just won’t shake the ICC off. The strongman of Khartoum already has an arrest warrant with his name on it for war crimes and crimes against humanity. To this the international criminal court has added three counts of genocide, the most serious charge in international law. It is interesting to see how friends of Khartoum, and African states in particular, will react to this new charge. The African Union chose to back Bashir the last time the ICC called for his arrest. Many African leaders have slighted the court for its disproportionate focus on African conflicts and human rights abuses. Since 2003 Mr. Bashir has been waging a war against insurgents (led by the Chad-backed Justice and Equality Movement, JEM ) in the Darfur region in the west of the country. More than 200,000 people have been killed and millions displaced from their homes as a result.